The Crooked River Gorge is a fascinating and scenic area near Bend that offers several miles of hiking trails, excellent fishing, challenging rock climbs, and breathtaking views of two of Oregon’s highest peaks. Enjoy breathtaking views of two of Oregon’s tallest peaks from the Peter Skene Ogden State Scenic Viewpoint. Hike along the river up to the top of rocky cliffs. 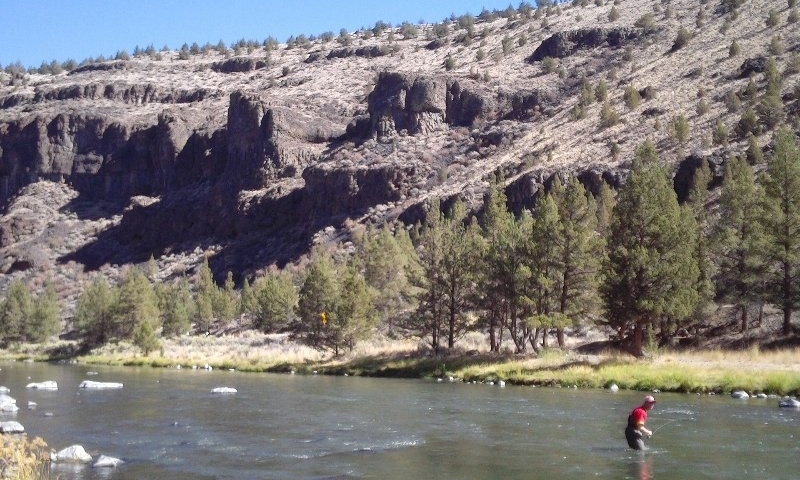 Abundant whitefish and trout can be found in the Crooked River. The gorge was created from a volcanic eruption over a million years ago. Crooked River Gorge is a fascinating geological area not far from Bend. This rugged, 500 foot deep chasm was created over a million years ago when the Newberry Volcano erupted and caused lava to flow into the Crooked River canyon. Visitors to the Ogden Wayside will enjoy spectacular views of Mt. Jefferson and Mt. Hood, two of Oregon’s tallest and most majestic peaks. The challenging crags and spires of Smith Rock near Redmond attract rock climbers from all over. Wildlife is abundant throughout the area, adding to the gorge’s breathtaking scenery. Crooked River Gorge, Oregon spans several miles of land near Bend. Crooked River National Grassland, 813 S.W. Hwy. 97, Madras, OR, 97741. Phone: 541-475-9272. Also, Oregon Parks and Recreation Department, State Parks, 725 Summer Street NE, Suite C, Salem, OR, 97301. Phone: 800-551-6949. Peter Skene Odgen State Scenic Viewpoint – One of the highlights of Crooked River Gorge, this viewpoint and park boasts incredible views of river canyons, towering basalt cliffs, and nearby mountain peaks. Just north is the 464 foot long steel arch Crooked River High Bridge, built in 1926. It stretches 295 feet above the floor of the canyon and is now open to pedestrians. Hiking – Several miles of challenging, scenic trails take hikers along the Crooked River to the top of rocky cliffs. Fishing – The Crooked River is a great place to fish for the redband trout and whitefish that flourish in its waters. The Rex T. Barber Veterans Memorial Bridge, which was completed in 2000, parallels the old Crooked River High Bridge. It is the first cast in-place segmental arch bridge ever built in the U.S. Construction costs were just under $16 million. Peter Skene Ogden led a trapping party through the Crooked River Valley back in 1825.